It all started on my last desert trip in my toy hauler when my wife fired up the generator and found that all the outlets were dead. I started poking around and found that my stock Converter/Charger had shorted out and was tripping the circuit breaker for the outlets. Luckily, with 4 6 volt batteries and a trickle charger, brought along for my Rhino, I was able to make it through the rest of the weekend. So I got home and started doing some research. My list for a replacement was short, as were my funds. 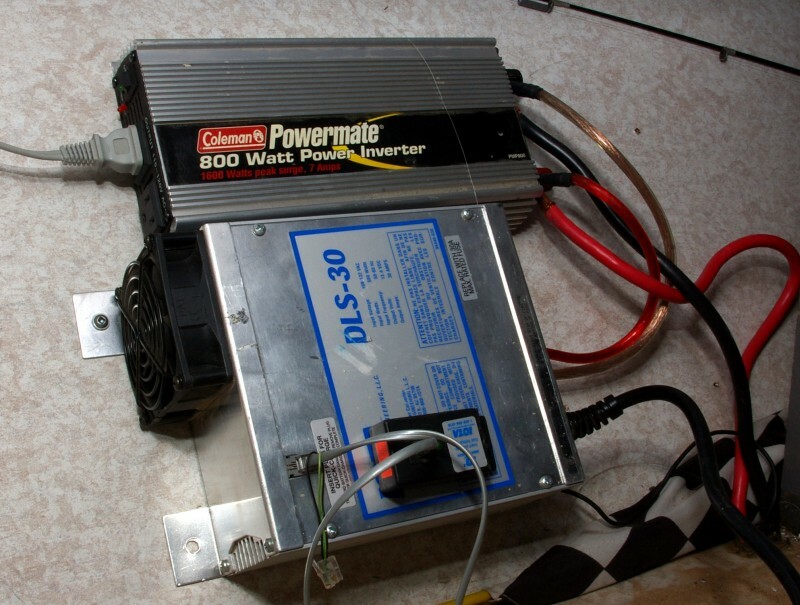 I wanted a Charger that had at least 30 amp output and an inverter with at least 1500 watts. I found a few but they were WAY outside my price range. 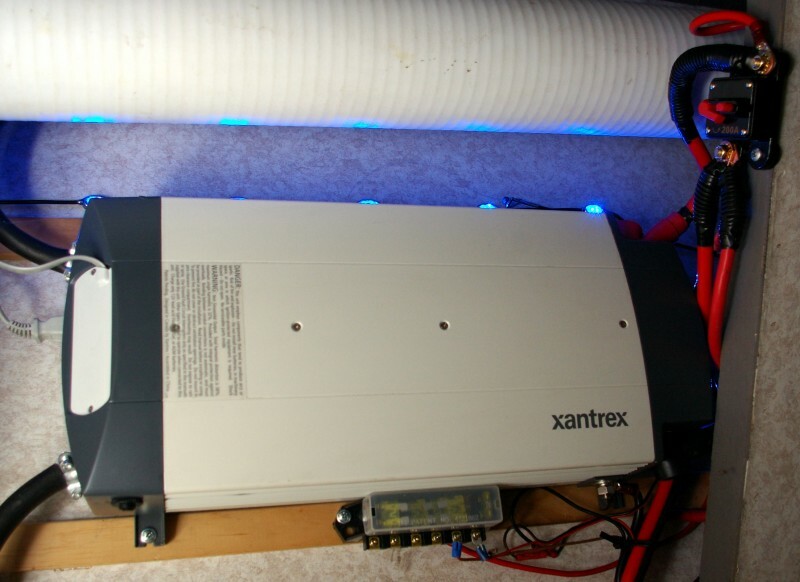 I came across the Xantrex Freedom series Inverter/Charger/Converter. It fit the bill, and how. Here are some of the features. 1800 Watts modified sine wave A/C output. 40 Amps of battery charging power. Remote control panel with led readout. 30 Amp Transfer switch for quick easy hook up. Best of all, about a $500 street price. I gave a call to Xantrex to make sure it was going to be perfect for me. After a quick conversation with the tech guys, I ordered one and waited eagerly for it to arrive. While I waited, I started thinking about what, where and how of the installation. Since you need as short as a run from batteries to Inverter and I have a storage area right next to my batteries, boom it was a natural fit. I started ripping out my old Converter and tossed it in the recycle bin! I made a mounting point and started the install. 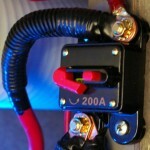 First it was the 12 volt side, I ran 2 gauge wire from the batteries to 200 amp circuit breaker and then to the Inverter. A nice fat ground cable back to battery. I also made up a grounding cable to the frame. On to the AC side, I tried as hard as I could to make it difficult. It is EASY, you can run the shore/Gen power line into Inverter and then Inverter to service panel! The automatic transfer switch handles the rest! When you turn the Inverter on it switches over to power out and when you switch it off and hook shore power or turn on the generator, it passes power through and takes a little for charging the batteries. The last part of the job was to install the remote control panel. I installed it near the bed so my wife could adjust our sleep number bed with out getting up and starting the Generator. First: the battery charger. If you watch the display, it shows you what it’s doing. Bulk, Absorption, and Float/Full. Bulk charge recharges the batteries at the rated 40 amps until it gets almost fully charged, at which point it switches to Absorption charge. It then switches to float charge when it gets to 12.8 volts. Need a recharge, just start the generator or plug it in and the system turns it’s self on to start charging! I have had it plugged in for a month at a time and saw hardly any water loss! With my old set-up I would get water loss even though I had a charge wizard.. So, 2 thumbs up on the charge part. 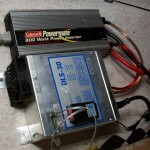 Second: 1800 watts of inverter. Microwave, TV’s, DVD players, Digital Converters, and our Sleep Number bed all worked flawlessly!! It’s easy to use, press and hold the green button till it beeps and then you are good to go! When done, press and hold green button again! Need a recharge, just start the gen or plug it in and the system turns it’s self on to start charging! Convertor: Well no dim lights or switching bright/dim like some units. No problems on the 12 volt side. 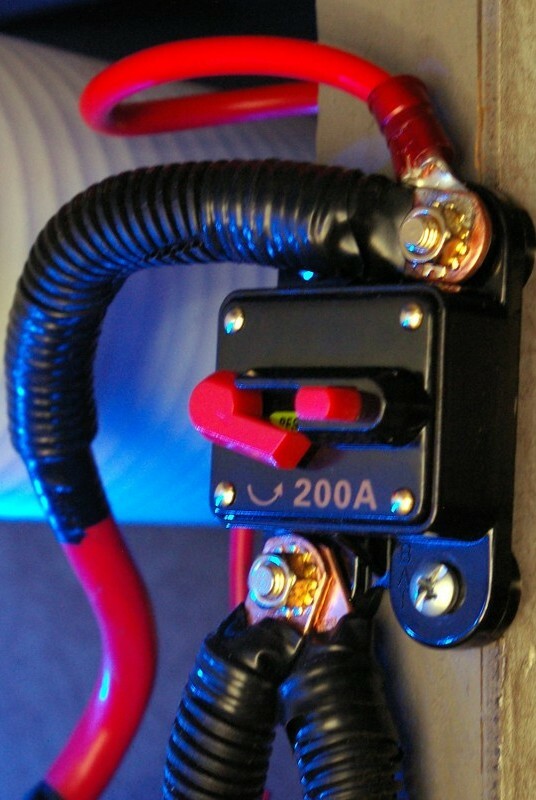 Conclusion: I have used the Inverter on a few toyhauler trips and it has not let me down. My batteries are always fully charged and ready to go. It works better than the OEM Converter/Charger with an add on Charge Wizard and works great as Inverter. I truly recommend this unit if you are looking to upgrade and/or install an Inverter. If you are looking for an affordable, easy to install and use Inverter/Charger. The Xantrex Freedom HF1800 should be your first choice! Sure you can buy a larger more expensive unit, but why. A bargain in my book..
maybe you can explain why 2 gauge wire was used when Xantrex own install guide says 2/0 is required? 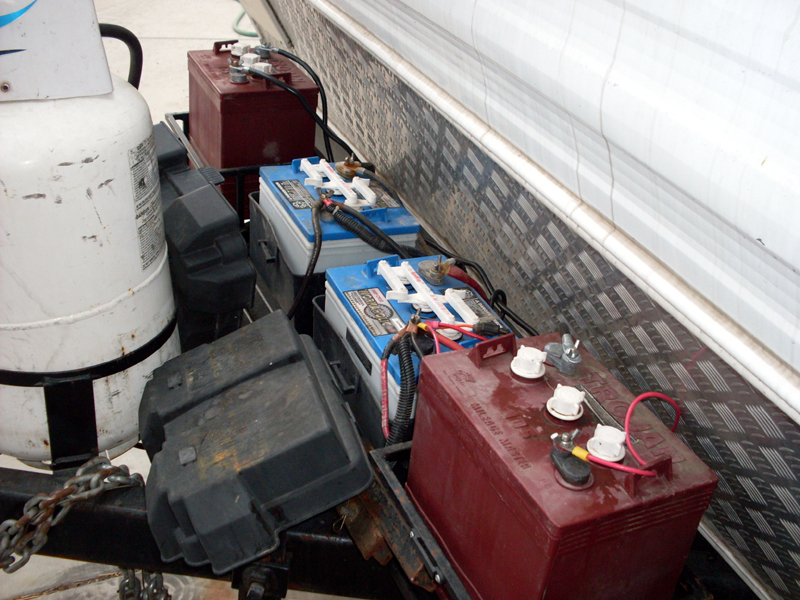 also the run should not be more than 5ft total between the inverter and batteries. i also didnt see anything about Deep cycle batteries being used. I am running 2 sets of 6 volt Deep Cycle batteries and the 10 foot run of cable was for both batteries. I couldn’t find any 2/0 gauge at the time of install and will upgrade when I get new batteries.. For now it works GREAT still! The only thing I have learned over time is, you have to turn it off when not in use. If you fire up the Genny, it will automatically start up to start charging, but when you turn off the genny, you have to shut down the Xantrex. Get the 1800 for the 40 amps of charging..
curious about when you hook up the inverter to your Junction box/converter/charger assembly. do you power the existing converter/charger or do you disconnect the existing charger? I removed the factory conveter/charger and just have the Xantrex. Hey Darryl, great detail and simple to foolow, I think…any chance of a simple schematic or wiring diagram? Thanks for the info. I don’t have a diagram, but I did it as simple as I could. 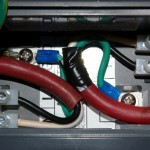 I had already installed a 30 amp auto transfer switch. I removed the shore power input and ran a line from the inverter/charger to the transfer switch and then a line to a plug for shore power should I need it. The Inverter/Charger has it’s own transfer switch so if I plug it in it’s good, if I fire up the genny it’s good and if I click on the inverter it’s good. I have purchased 1 truck volvo with Freedom HF1800 installed in volvo manufactury. It works great. 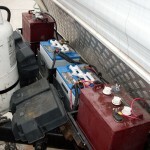 Then I have ordered 2 more trucks with same inverters. They didn’t work good. It barely works with microwave 900 wats and need truck engine running in order to heat something in microwave. Fault codes always appear on screen like EOS 5 and 3. I took few times my truck to dealer to repair they even change for a new one. Same thing. I refused to take a second truck with same inverter because it has same problem. And odered another truck without inverter. Nobody from volvo was able to repair it. They check all connections and still same problem. Truck was brand new. May be I need to call to xantex. But how they will help me if my trucks in Canada. A solution has been implemented for this issue. Please call our tech support line and ask for my contact info. I have bought the HF 1800 and about to install it. 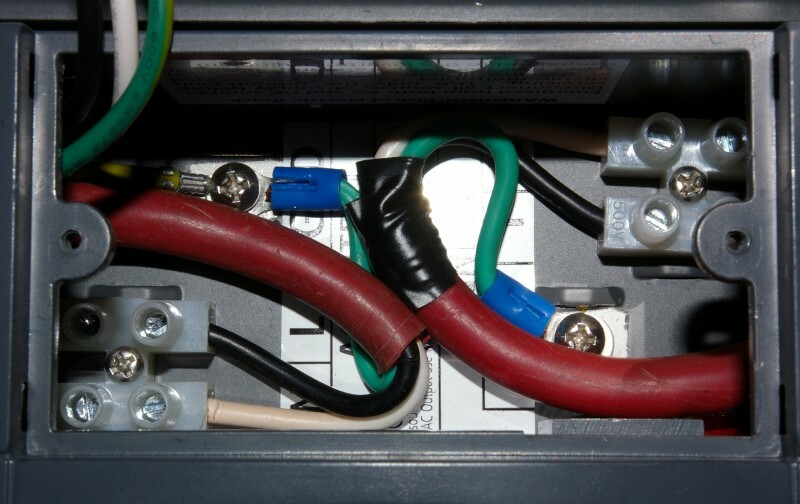 I would like to know if you connect the input to the inverter/charger to the main a/c breaker and then out put from inverter back to breaker, to complete the loop. won’t that mean that your air conditioner, water heater will also try and run off it when its in the on position? I only want my GFCI and Microwave oven on it. Not those others. how do I accomplish this? I have only heard good things from Xantrex inverters. time will tell. Is the Xantrex 1800HF equipped with a galvanic isolator or do I need to install an external one?